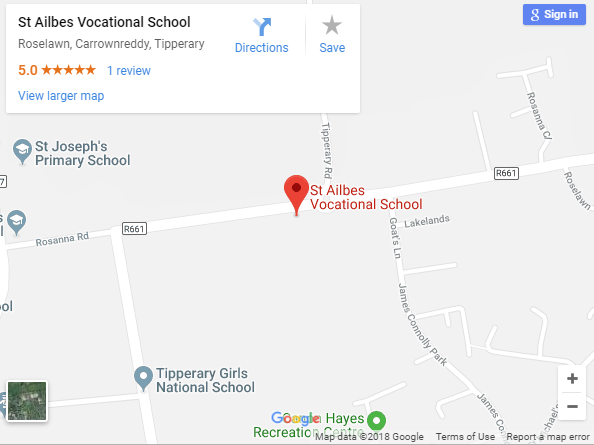 St. Ailbe’s School is under the auspices of Tipperary ETB. The original school pre-dated the 1930 Education Act which established Vocational Education. Throughout its development, St. Ailbe’s School has been to the forefront in educational advancement. It participated in the pilot programme for Transition Year which is now offered in almost all schools in the country. The school was one of the first in the country to offer Vocational Preparation and Training courses. Senior Certificate was a programme that was also piloted in St. Ailbe’s and gained national acceptance and was later replaced by the Leaving Certificate Applied Programme. The school was also one of the first to offer the restructured Leaving Cert. now termed the Leaving Certificate Vocational Programme now also available nationwide.Several adult courses are also offered in the areas of childcare, office technology and health studies. These courses offer school leavers and mature adults the opportunity to join or re-join the national workforce.Many new programmes, such as CSPE, were trialled in St. Ailbe’s School and have subsequently been introduced nationally. St. Ailbe’s School was one of the first to introduce an elected Student Council something that is now required in all schools.